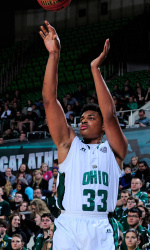 Tony Campbell commanded the paint on Monday night and led Ohio to a 65-58 victory over Arkansas-Pine Bluff (2-11). The junior forward earned his sixth double-double of the young season with 26 points and 12 rebounds in Ohio’s fourth consecutive win. Campbell’s 26 points were a career-high. The double-double is his fourth in as many games. Ohio coach Saul Phillips thinks his forward’s boosted performance has something do with Ohio being on winter break. Campbell also played a part in Ohio’s dominating defensive effort. He and the other Bobcat big men limited Arkansas-Pine Bluff to just over 25 percent on 2-point field goals. The Golden Lions countered by sinking 11 of their 20 3-pointers. The Green & White’s night was a sharp contrast from its’ opponents. Ohio (8-3) sank 47 percent of its shots from the field, but only hit two of its 14 3-point attempts. The Bobcats never trailed in the contest and held a 35-20 rebounding advantage over the Golden Lions. Treg Setty aided in the winning effort with 13 points and seven rebounds. Jaaron Simmons finished with six points and six assists. Ghiavonni Robinson led Arkansas-Pine Bluff with 21 points, including four 3-pointers. Trent Whiting added eight points and four assists. The team gets a four-day break to celebrate Christmas with their families before returning to Athens on Saturday, the 26th. The Bobcats will return to the court for their final contest of 2015 on December 30, hosting UC-Riverside at 7 p.m.